Captured from a moving car, I wasn’t able to take the best angle. 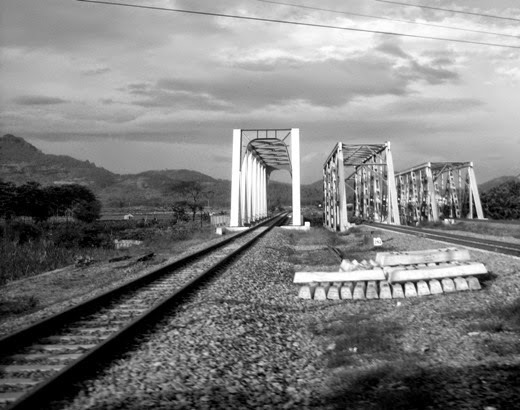 I forgot where exactly the railway bridges are, but the location is not far from my husband’s hometown (Bumiayu, Central Java Province, Indonesia). Dramatic light and sky in your fine photo. You did well! Those bridges make a great design. I'm worried about where you were standing when you took this shot, hope you were not on the rails. Very nice light and spectacular view, very good one! Not appear to be made ​​from a moving car! Great shot of the tracks and bridges.